When TK Major assumed responsibility for the web operations of a busy streetware company, their online catalog consisted of hundreds of separate web pages, each one individually coded with prices, sizes, and other item details. Changing the price of an item line (for instance, men’s T-shirts or hooded sweatshirts) meant editing scores, if not hundreds, of files, one for each individual shirt design. But changing system-wide values like the shipping cost or tax rate or changing the site’s credit card service provider — all of which had become issues — could mean editing complex code in hundreds of files. And a long-desired style makeover for the site had been put off repeatedly in the face of what was (correctly) perceived as a monumental ordeal factor. By redesigning the website around a high-performance relational database, TK Major was able to deliver a flexible, efficient solution to what had been an overwhelmingly complex business growth problem. Now, changing the price of a line of clothes, the shipping or tax rate, adding new items or moving an item from one line or department to another (or even putting an item in multiple departments) is literally only a few seconds work that can be done by any of the company’s sales staff. And — because the new system can use a single data-driven page to present any of hundreds of individual items — the number of actual web pages used to display merchandise has dropped from many hundreds to just a few pages — making style and other changes across the entire site painless and quick. 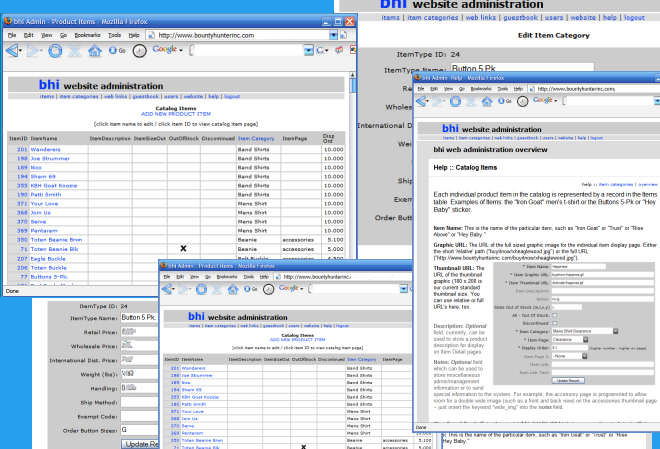 The finished system includes the data-driven online catalog and ordering system, a message board, administrative user system, graphics uploader/transfer utility, and a links database — making it easy for the company’s staff to update the site themselves.